Jazz legend Thelonious Monk was one of a kind – witty, offbeat, dissonant, totally unpredictable. Musicians and singers have been attempting to re-create the singular Monk magic for years to little avail. 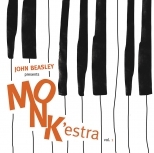 Enter the fearless and talented pianist/arranger John Beasley, who not only takes on Monk’s challenging but rewarding music by doubling up on the quirk, wit, and unpredictability, but orchestrates a 15-piece big band of Los Angeles’s finest jazz musicians to pull it off. MONK’estra, Vol. 1 is, as the man himself might say, a gas.